Interesting how they select, train, and condition the bulls. Including its diet. “Han-u (한우 in Korean, also Hanu, Hanwoo, or Korean native cattle) refers to a breed of cattle raised in Korea, Bos taurus coreanae, which may be a hybrid derived from the cross-breeding of cattle and zebu. Its maternal lineage is taurine (European-type) cattle. 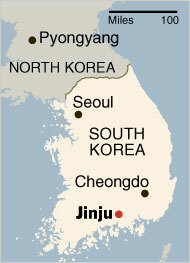 JINJU, South Korea — Gangta, his neck muscles rippling, butts his head against a pine tree. Like a prizefighter, he does roadwork on a hilltop training ground, dragging in stoic plods a 450-pound tire filled with rocks. Gangta, or Power Punch, is a 10-year-old fighting bull weighing 1,840 pounds. He is also a three-time heavyweight national champion, a star in a sport that once meant as much to South Koreans as the Kentucky Derby does to some Americans. Unlike Spanish bullfighting, there is no matador. In South Korea, bull fights bull. Tons of muscle charge at each other, and clumps of bloody hair fly as the animals bang heads, their horns clashing like sabers. That may sound brutal, but bulls rarely die in the ring. The fight is over when one turns tail. Some matches stretch on for hours. Others end before they start: the bulls stare each other down, and one walks away. Popular interest in bullfighting, once regular village entertainment in South Korea, has waned in recent decades, a victim of television, the Internet and more-global spectator sports, like soccer and baseball. But in the last few years, some cities have begun promoting bullfighting as a tourist attraction and the government now hopes to reignite the old passion by legalizing ringside gambling, starting in July. Mr. Kang, 32, is one of about 500 rancher-trainers who own the country’s 1,500 or so fighting bulls. Most bulls are chosen from cattle headed for the slaughterhouse when they reach the age of 2 and weigh nearly 1,000 pounds. Mr. Kang and other trainers travel the country in search of talent among these young bulls. “We look for small, furry ears, eyes menacing like a snake’s, big horns and a thick neck with a long, low-slung torso,” said Mr. Kang, a former computer engineer who writes a blog on bullfighting and is one of three ringside commentators certified by the National Bullfighting Association. A bull can grow to well over a ton and compete until he is about 15. To start him on his career, owners bind the young bull’s horns with wires to shape them into weapons. Fighters are also distinguished from other bulls by what they eat. Their basic vegetarian diet is often supplemented with fish, live octopus and snakes. When a bout is imminent, Gangta gets herbal soups laced with ginseng, and energy drinks usually sold in pharmacies for people suffering hangovers. On the day of a match, many are fed soju, a fiery grain liquor. “We don’t know for sure whether a bull has been drinking,” Mr. Kang said, “until he gets exhausted and starts panting,” allowing bystanders to smell his breath. Mr. Kang’s day begins at 6 a.m., when he serves his 13 fighting bulls the first of four hot meals a day. On this morning, Mr. Kang was busy stoking the fire under a caldron filled with bean sprouts, rice stalks, corn, yams, potatoes, pumpkin chunks and anchovies — a stark contrast to the factory feed that goes to ordinary cattle at Mr. Kang’s ranch in Jinju, about 180 miles south of Seoul. Later in the day, Mr. Kang and Gangta climbed the hill behind the ranch for training. Gangta knew the routine, stopping to rest whenever Mr. Kang’s cellphone rang. After an hour of dragging the tire, the bull stalked Mr. Kang, demanding his reward: a full-body scratching. Animals and owners develop a close bond. During fighting season, which runs from March to November, they travel together to the 11 cities that stage bullfights. On the road, Mr. Kang sleeps in a tent beside his bulls. Around the amphitheater, bulls wait their turns like gladiators while their trainers sharpen their horns. Between fights, cheerleaders in miniskirts prance in the ring. Folk musicians let rip with a frenzy of drums and gongs. Children crowd snack stands, which often promote local beef. Since the revival of bullfighting, unofficial ringside gambling has become common and some bulls have developed national followings. The bullfighting renaissance taps into the unusual attachment South Koreans feel toward the animal. In South Korea, an agrarian society until a few decades ago, a cow or bull was a farmer’s most prized asset. The animal pulled the plow, carried the loads on its back and was sold when the farmer needed money for his children’s education. Maintaining a fighting bull still requires some means. In a national tournament, a champion is typically awarded 10 million won, or about $6,730. But most of the other finalists get only about $200 to $350 a fight — hardly enough to cover their feed. But with the government set to allow legalized gambling in one bullring in each province — starting in the central city of Cheongdo, where a 12,000-seat bullring stands ready — Mr. Kang sees a promising future for the sport. He dismissed concerns that the pastime’s revival might attract charges of animal abuse. Next Post Lee Jin-gu: Deep affection for his Bulls. Slept with his bulls for a week.